The reason for asking for a loss debrief are obvious: You want to find out what the client felt were the shortcomings of the proposal. In addition, asking for a debrief creates good will by showing the client you are eager to learn how to improve the way you do business with him. People like that. Was our proposal responsive to your needs? If not, which ones did we miss? Did we meet all the solicitation requirements? If not, where were we deficient? Did it sound like we understood your project? If not, which aspects did we come up short on? Did we clearly call out the benefits to you of our approach? If not, which ones did we miss? Was our technical approach to resolving your problem adequate? If not, what was it lacking? Was our approach to managing the project what you were looking for? If not, how could we have improved it? Were our costs too high? Was the proposal easy to understand and follow? If not, which sections did you have trouble with? These aren’t the only ones you can ask, but they’re a start. Who should attend? The proposal manager needs to attend these debriefs; he or she is the one who knows the document well enough to lead the client into giving the kinds of answers you want. You could also send appropriate technical experts who served on the proposal, if there are some technical elements you want clarified. I also urge you to send along someone from your marketing/proposal staff. This person will listen hard for clues on how to prepare a better proposal the next time around. Key items to remember. You are not there to complain about the client’s decision. Nor are you trying to pry information out of the client about how the winner—your competitor—did (though the answers to your pointed questions carry implications about how the winner addressed certain issues). And no sour grapes. No one likes a whiner. “Why ask for a win debrief? We won. End of discussion.” That’s true; you won. And everything in the proposal was perfect, right? Wrong. Remember that the client’s selection process is really a process of elimination. That means that every other proposal was eliminated but yours. That doesn’t mean yours was flawless. You want to attend a debrief after you win for many of the same reasons you do after you lose—to learn about how to improve your proposals, especially to this client. 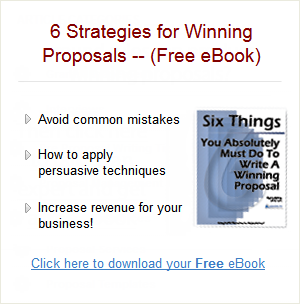 This will certainly help you on future proposals, not only with this client but with others as well. To prepare for the win debrief, list the areas you tried very hard to succeed at in your proposal. Did you identify a key set of themes and try to weave them throughout the proposal? Ask the client if that was evident, and if it had the desired impact. Or maybe you felt your technical approach was particularly innovative. Did that come through? You will likely never find the client more willing than right after contract award to be up front and candid with you. In fact, he may be too effusive in his praise. You may get a lot of atta-boys instead of honest evaluations. If this is the case, keep him on track by asking your specific, focused questions. A caveat: Be on guard about the tendency to be smug. Like sour grapes, a smug attitude at a win debrief is easy to spot, and can be disastrous.